Since its conception in 2006, the Sedehi Diversity Project (SDP) has provided the Muhlenberg community, in particular the incoming freshman class, with a look into the perspectives of interviewed students, staff and other faculty and Muhlenberg community members. 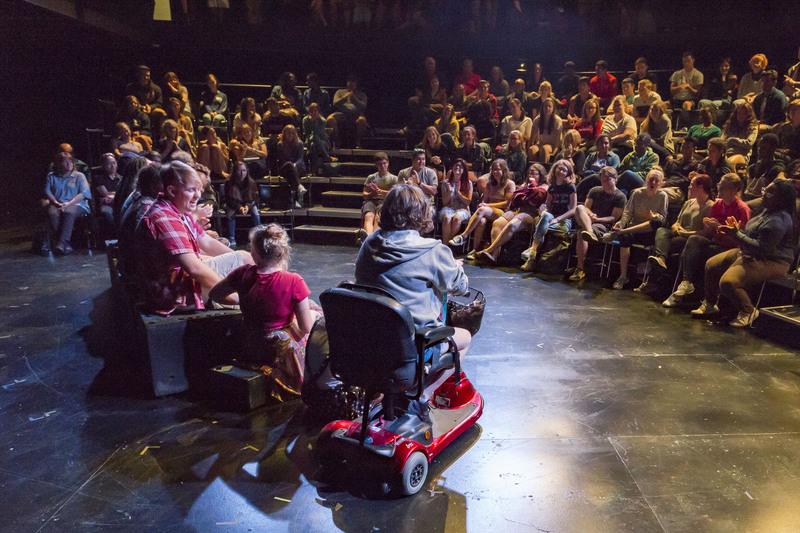 The documentary play, performed over orientation weekend, puts a particular focus onto underrepresented members of the community and their ideas. During the five-week process of creating the play for that year, the student director and ensemble members work to decide which main ideas they want to present through the performance, based almost entirely on the information they received from the various community members that they interviewed, as well as incorporating a bit of their personal stories as well. This year, the Sedehi Diversity Project was led by Melina Economos ’19, who had previously been in the ensemble of SDP, but, as a senior, served as the student director for this year’s production. Her role as student director included leading rehearsals, script-making, script-building and staging. Along with seven ensemble members and faculty advisor Troy Dwyer, they begin the process of creating the play in the spring and into the summer by interviewing Muhlenberg community members, transcribing these interviews and then going through them, picking out quotes and combining them to make the script. Economos called the Sedehi Diversity Project a “really good challenge for me because not only are we representing who we are as a community, but we were also lucky enough to have the set from Tal, which was a really fun directing challenge … in the round, and we also got to keep the rainbow floor.” This setting was new to this year; the Sedehi Diversity Project play had never been performed in the round before. Ensemble member Robyn Phan ’21 explained how this element of the performance helped the cast members to be “constantly moving and making sure we connected with everyone who was there.” The play tells personal stories, and the play being in the round created a personal environment for the audiences to hear these stories as well. One particularly impressive element of the play is that, according to Economos, “Everything that is in the script in the final project is something that someone actually said during one of those interviews, and it’s about finding a way to allow those different interview subjects and their voice to have a dialogue with each other without being present at everyone’s interviews.” It is in fact the content of the interviews that lead the director and ensemble members to decide what topics to focus on, not the other way around. Phan explained, “Going into the interviews, we didn’t really have any set questions that we wanted to ask, except for the leading one, which was ‘What does diversity mean to you?’ We just let the interviewees guide us along what they wanted to talk about and went with it.” This process ensures that each year, the piece is unique, and every interviewee has a bit of their story being told. Ultimately, The Sedehi Diversity Project, as Phan explained, helped her to realize that “there is so much more to Muhlenberg behind what they tell you on tours or what they show you on brochures, whether that be pretty stuff or the ugly stuff,” even in her freshman year. To provide this information from the Muhlenberg community’s perspective is a special opportunity that the college has had for the last twelve years, and the feedback that the Sedehi Diversity Project receives truly brings to light how crucial it is to the unique student experience of this school.